It will be possible to dispatch most jewellery items within 3-5 working days and where possible we have stated in the product description when the lead time is more than 10 working days. If you require an item urgently, please ring us on +44 (0)2920 344715 to check that the item is in stock before placing your order. Once your order is received we will reply with an estimated delivery date within a couple hours during our studio opening times 1000-1700. Your order will be dispatched by MyHermes, our preferred courier company with a 1-2 day deivery timeframe from collection within mainland UK. MyHermes provide a delivery slot with signature required on receipt. If you'd like an item to be received guaranteed by 1pm next day, this service is charged at £10 and is sent by Royal Mail Special Delivery. Please check before proceeding to purchase that the item you'd like is available for next day delivery! Items sent elsewhere, both national and international, will be via Royal Mail International Tracked & Signed OR UPS. A charge of £13.50 will be added at Checkout for international orders. If you require an item urgently, please ring us on +44 (0)2920 344715 to check that the item is in stock before placing your order. All orders are beautifully packaged as part of our complimentary gift wrapping service. We believe that buying online should be an enjoyable experience and have endeavoured to make the process of buying the items you'd like as simple as possible. You can read some of the kind feedback that Emma-Kate and the team have received on the Customer Feedback Page. 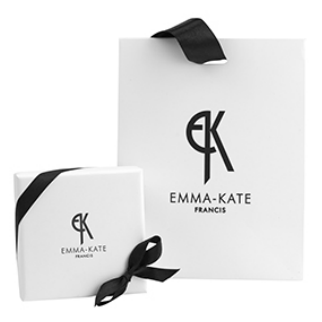 If you have any questions about ordering online, specific requests or would like to enquire about a commission please contact us on +44 (0)2920 344715, info@emmakatefrancis.com or by using the form on the Contact Page. We hope that all our customers will love their purchases and endeavoured to supply the highest quality goods and service, but in the unlikely event that you need to return an item we operate a simple returns policy - more information can be found on the Returns Policy page.